The Wisconsin Historical Society's Archives has approximately 3 million images in more than 6,000 collections. Materials include photographs, negatives, films, architectural drawings, cartoons, lithographs, posters, and ephemeral materials from private, business, and governmental sources. Formerly known as Wisconsin Historical Images (WHI), over 90,000 images are available online, and we continue to add over 8,000 images per year to the online resource. Digitized images include the full range of materials available in our physical collections. These archival visual materials document the rich social, economic, and political history of Wisconsin and the upper Midwest from the mid-1800s to the present, as well as those ethnic groups who helped shape its history. Image holdings are particularly strong in daily life from the turn of the century to the 1970s. In addition, our collections have a national focus in the areas of 19th century expeditionary photography, Native American images, mass communications, and social action movements including labor and civil rights. The Society houses the Wisconsin Center for Film and Theater Research collections, provides the offices for the Center's archivists, and offers public access to the collections through the Archives Reading Room on the 4th floor of the Wisconsin Historical Society Headquarters building. Madison, Wisconsin. 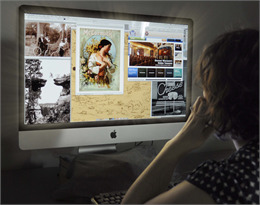 A researcher views images online. Each month we feature a gallery of compelling images drawn from visual materials in the Society's Archives. These galleries reflect the wide range of subjects, photographers, and collections available for research. Each includes an essay to provide the historical context and background of the images. Madison, Wisconsin. 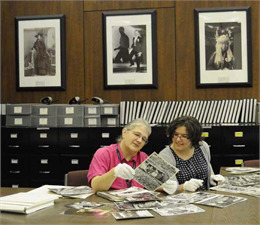 A researcher and staff member work with visual materials in the Archives Reading Room, located on the 4th floor of the Society's headquarters building. The vast majority of our visual materials are not online. They are located among thousands of collections in the Archives. To locate specific visual materials, start by searching the Library Catalog, the Society's online catalog for both library and archival resources. The collection description will note if it includes photographs or other visual materials. When you find a collection or item you wish to view, print the record page that shows the call number/shelf location information. Then, visit the Archives Research Room at the Society, fill out a call slip, and an Archives staff member will retrieve the materials from the stacks. The Archives Research Room also has browseable visual materials files by subject, place and organization. Learn more about subjects available for research both online and in the Archives. Visual materials in the Archives do not circulate and must be viewed in the Archives Research Room on the 4th floor at the Society Headquarters building in Madison. In addition, because of their fragility, visual materials do no not transfer to Area Research Centers. Nearly all online visual materials are available for purchase as high-quality archival pigment prints or digital files, and many may be licensed for commercial use. Photocopies of documents in the physical collections are available for a fee. Access to films and videotapes is coordinated through the Society's Archives Research Room and takes place on the 4th floor of the Wisconsin Historical Society building at the WCFTR Film Archive. Films can be viewed by anyone working on a specific research project. You do not have to be affiliated with the University of Wisconsin, the Wisconsin Historical Society or another academic institution. However, we cannot accommodate requests for viewing unrelated to research. All films should be reserved by call number. The call number for each title is noted in the call number field of the catalog entry.